As the stack passed over NASA's network of communication stations around the world, its orbit was carefully measured and intensive calculations made on FIDO's behalf that allowed him to choose exactly when and how the TLI burn should be made. This information was radioed up to the Saturn's instrument unit, which would control that burn. In particular, the computed time of ignition was back-timed to a moment 9 minutes and 38 seconds earlier, when the instrument unit needed to begin Timebase 6 - a choreographed sequence of events that would lead up to ignition and through the burn. 1 See Chapter 8 for a fuller explanation of the PAD, including a worked example. the state of a switch in the CM to verify that the crew really did still want to go to the Moon. This switch was provided so that further preparations for ignition could be terminated in case a problem surfaced that meant calling off the lunar phase of the mission. If all was progressing well, valves were closed to stop the S-IVB's tanks from venting, and a burner was ignited to heat the helium that repressurised the tanks, preparing them for operation. At 100 seconds before ignition, the computer display blanked to let the crew know that the guidance system had begun to measure whatever acceleration the S-IVB was about to impart. With 80 seconds to go before ignition, the aft-facing ullage motors within the APS modules fired to push the fuel and oxidiser to the base of their tanks in order to settle them and provide a little head of pressure into the engine. The crew still had options to stop the S-IVB from starting up. If they did so earlier than 18 seconds remaining to ignition, the inhibit switch would work; otherwise, an adjacent switch, one which normally made the second and third stages of the Saturn separate, had to be used. At 8 seconds prior to ignition, valves were opened to route hydrogen fuel through the walls of the engine to chill them. As this was a restartable engine, the 'start' tank had been refilled with hydrogen during the first burn. At the calculated time of ignition, the contents of this tank were discharged through the pump turbines, spinning them up and increasing propellant pressures in the pipes leading to the core of the engine. 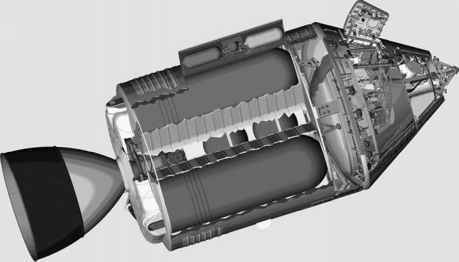 The propellant valves, which had been cracked open slightly at this point, then began to fully open, allowing a rush of fuel and oxidiser into the combustion chamber where a flame initiated full combustion and the engine brought itself up to full thrust.